Hey lovelies! Welcome to October then, literally my favourite time of year for blogging, where everything is pumpkin-spiced and fall-themed, and I'm so excited for all the posts I've got coming up in October! 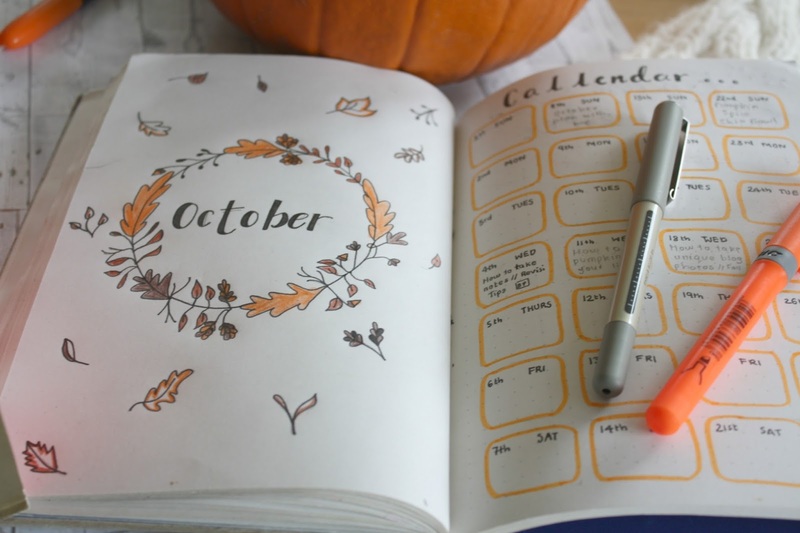 Like every month, October is a fresh start in my bullet journal, and since the last time I showed a snippet of my September journal plan on twitter it got a ton of positive feedback, I thought I would make a Bullet Journal 'Plan with Me' post. I've binged watched these a lot on youtube lately, where people take you through their journal spread for the month, all the pages they use, and of course all the artsy designs that are great for inspiration! 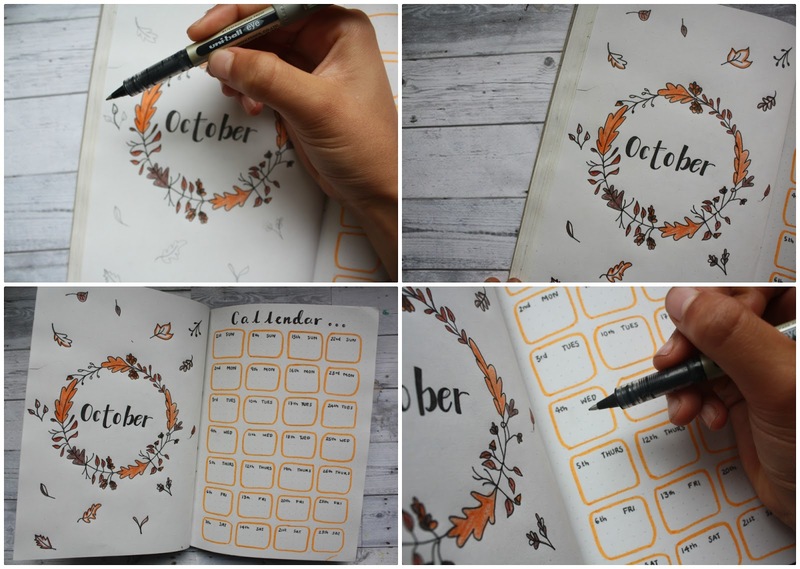 In this 'Plan with Me,' I'll be taking you through my plan for October and how (I hope) I will stay organised this month...ft. an autumn theme to match haha. The first page I always do to start a new month, is my title page! This is the part you might've seen on my twitter before and it's one of my favourite bits to do because you can change it up every month. 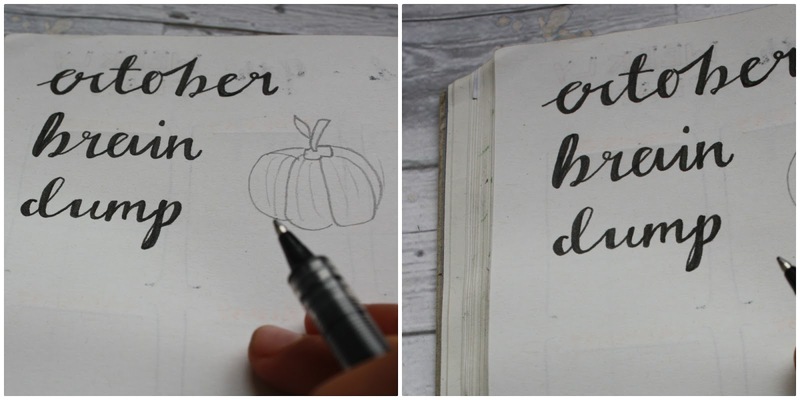 For October, I was mainly inspired by this bullet journal video from Amanda Rachlee (- who actually featured a pic of my September Title Page in the video whattt!) and so I ended up going for the same autumn-leaves sort of theme with a wreath because it matches October perfectly. For the page all I used were some 7mm unibal ink pens, and colouring pencils, which I'm pretty sure were only crappy WHSmith ones so it just goes to show that you don't need anything fancy! The next thing I always make sure to include is a monthly calendar. This month I actually drew this out differently, with lots of rounded boxes instead of a grid-style calendar like I usually do but I'll have to see which version I like best this month! That's the great thing about bullet journals, it's super flexible and easy to find what works for you and change it up whenever you want. For this page I carried on with my orange theme, and filled in all the dates in the boxes, leaving room for me to write blog post ideas and reminders in for each week. This is something new that I'm trying out after seeing it in quite a few other people's 'Plan With Me' videos and so I have no idea whether I'm going to love it or hate it this month! On the page it leaves room for me to note down all the things I've bought this October, from shopping splurges to random buys at tescos... as well as any money I've earned this month, either from blogging or my parents. Hopefully this should help me see exactly what I'm spending so I don't have that 'where'd all my money go?' moment at the end of the month! After that I drew out my Brain Dump page, which is exactly what it sounds like! I've always included this one in every bullet journal post on my blog, and it's basically a dump page for me to scribble down any ideas or notes throughout the month. It looks like a blank page in the picture, but already since then it's now covered in scribbles of blog post ideas and reminders haha! Then I drew out my weekly spread, which I drew in curved boxes for each day of the week and an orange theme like the rest of the pages. A weekly plan is so helpful for busy days and basically leaves space in every box for a visual 'to-do' list. Mine's usually filled with notes like 'Gym today,' 'Finish Maths Homework' or 'Guitar Lesson' on a Thursday. The layout of my weekly spread changes every month tbh but hey, this is how October turned out! Hope you enjoyed this post and you are having a fab October so far. Tweet me // Tag me in any of your own bullet journal posts and pages because I would LOVE to see and get inspired for next months pages. You can also click here to read my other Bullet Journal themed blog posts and let me know if you like this 'Plan with Me' style post and whether you'd want it to be a regular series? Happy Wednesday lovelies. QOTD: WHAT'S YOUR FAVOURITE MONTH? You're so creative! I love the way you have organised everything and incorporated autumnal colours and drawings - so aesthetically pleasing! I love your blog and everything about it. The layout and whole design is beautiful! So glad I found it. I'm into bullet journalling myself, this post was very inspirational. This is so cute! I tried to do a bullet journel and kind of failed. Haha. I love your theme! This is super cute, I love all your little illustrations and love how you set your journal out. I don't bullet journal myself but I love how you've set it all out. I feel a bit inspired to maybe start my own now! Your bullet journal is amazing! If I had a bullet journal I would want mine to look as creative as yours. I also wish I had the time to do it every month! I'm hopeless at keeping any form of diary/journal but yours is so beautiful it makes me want to make one of my own! This is gorgeous! I love bullet journaling and have always wanted to create a journal like this, will definitely be giving it a go!